Decorative cut-outs are laid over a backing of green, red, blue and gold foil in this small but elegant piece that may have been used as a prayer card. Unknown date. Apollonia, born circa 200 AD, is reputed to have been of Greek descent and the virgin daughter of a heathen magistrate of Alexandria, Egypt. 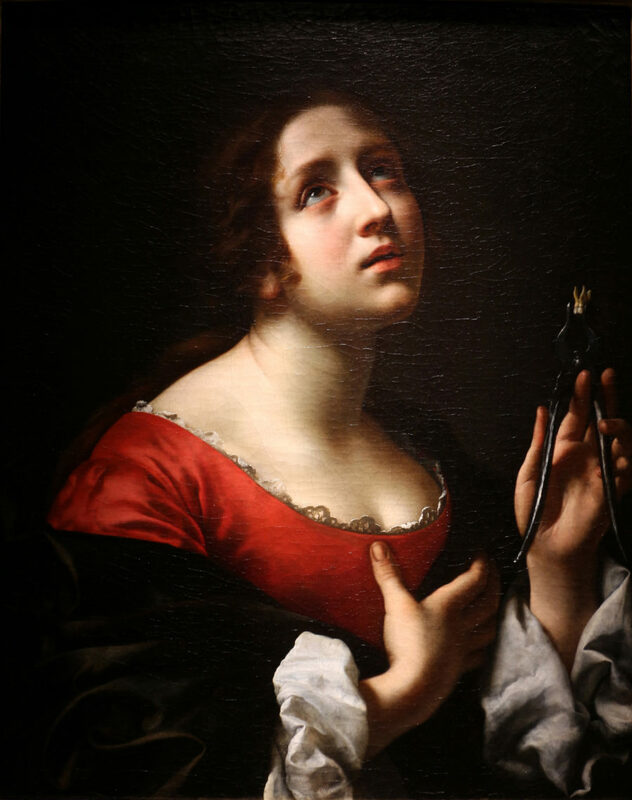 Held in high esteem and admired by local Christians for her “chastity, religious devotion, and charitable deeds,” she was martyred in the year 249 AD. The details of her torture and suffering were remembered vividly and recounted by those who witnessed the horrific event. 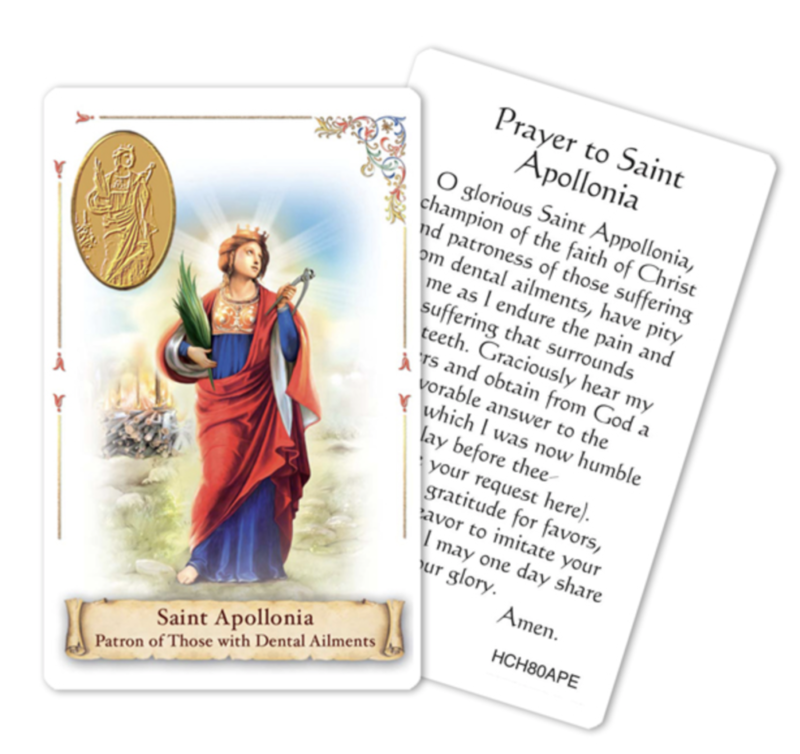 Some fifty years later, in 300 AD, prior to Christianity becoming the Roman Empire’s official religion, she was canonized as St. Apollonia. Subsequently, she became the patron saint of toothache sufferers and of the dental profession. According to historical accounts, in 248 AD the citizens of the Roman Empire were particularly anxious. That year marked Rome’s millennium, with 1,000 years having passed since the city’s fabled founding in 753 BC by Romulus and Remus. Although the Empire’s inhabitants appreciated its splendor and longevity, a feeling of doubt existed about its future. Would the next millennium bring continued stability, or would political unrest within, and barbarian incursions at the borders, bring chaos and uncertainty? During the millenary celebrations, a Roman poet is said to have foreseen catastrophe caused by the Christians. Despite the Roman Emperor’s efforts in 247 AD to appease the ancestral pagan gods with sacrifices and ensure peaceful succession by ruling jointly with his son, the two were killed in battle in 249 AD, and instability began to spread. A sense of foreboding must have been pervasive among the Empire’s citizens. For many centuries following her death not much was written about St. Apollonia, but in the 14th century, as dental ills among people of Western Europe increased, her glorification, retold in at least six differently embellished accounts of the original incident, began to spread. No sophisticated means of dental treatment or extraction were available then, and home remedies offered little relief. Desperate to alleviate their intense pain, toothache sufferers began to beseech the benevolent spirit of St. Apollonia for divine intercession. In recognition of her importance as a sacred benefactor bringing solace to the dentally afflicted, many churches, chapels, convents and shrines were dedicated in her name. 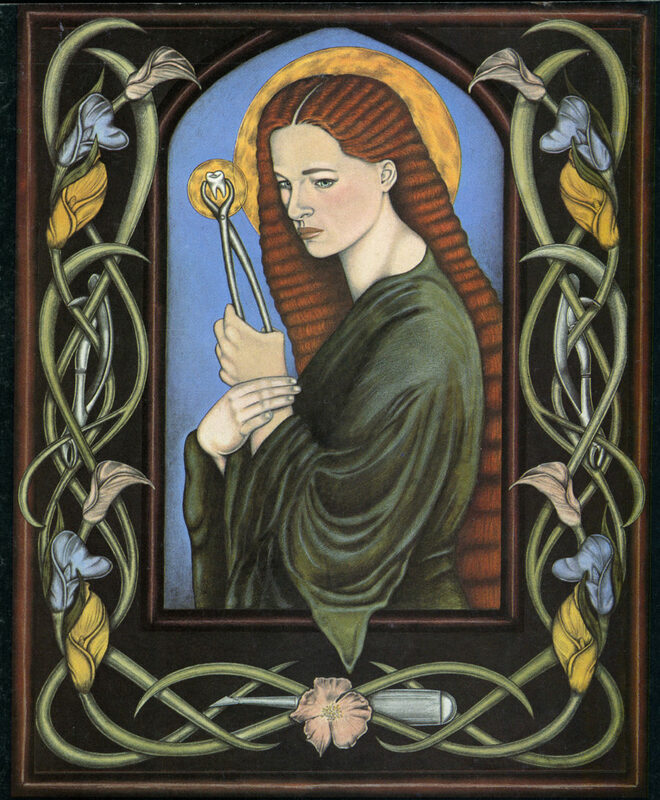 She has been depicted in artistic paintings, statues and woodcarvings, and revered in cathedral stained glass images, religious dramas and literature since the Middle Ages. In various areas of Europe, fasting and uttering an appropriate prayer on the day of her celebration (Feb 9) is believed to guarantee a toothache-free year. 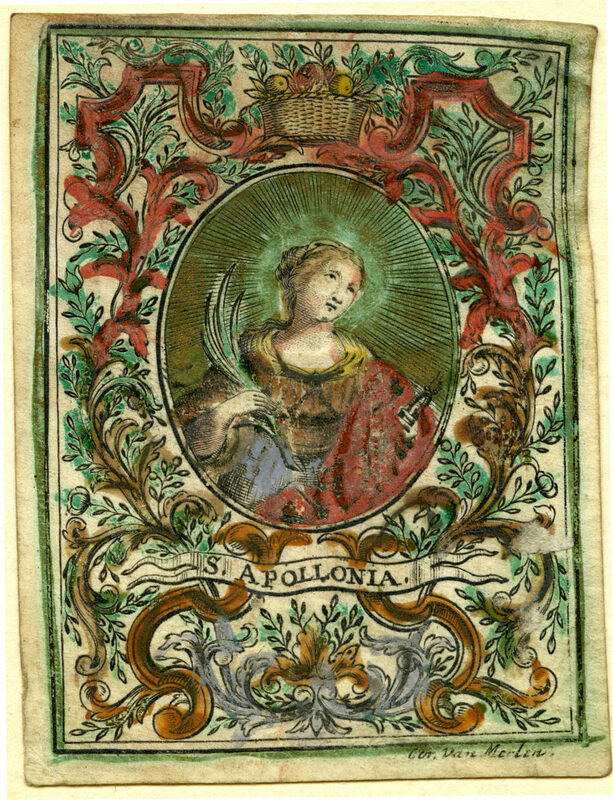 Today, St. Apollonia is considered the patron of dentistry, and many dental societies, magazines and practices have been named in her honor. Her association with dentistry is often attributed to the 18th century, but may have occurred much earlier. During medieval times, various European trades embraced Christian martyrs to protect and symbolize their occupations, and she would have been an obvious choice for those specializing in toothache relief. Early evidence includes an engraving of her in Franciscus Martinez’s 1557 work De Dentione, considered one of the oldest monographs in the history of the dental profession. 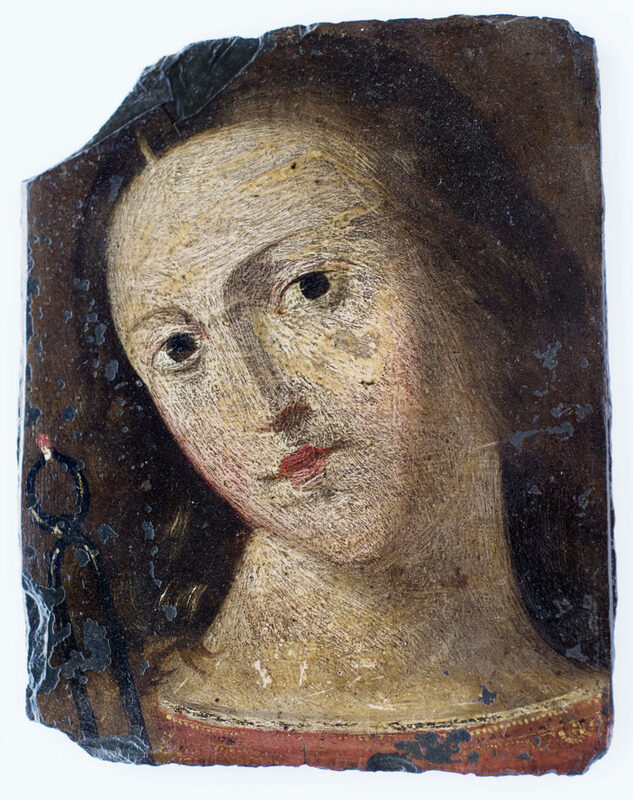 As “an admirable virgin in advanced age” made an unappealing subject to painters, writers and the distressed, St. Apollonia’s image grew youthful and more beautiful, and her story increasingly romanticized, through the ages. 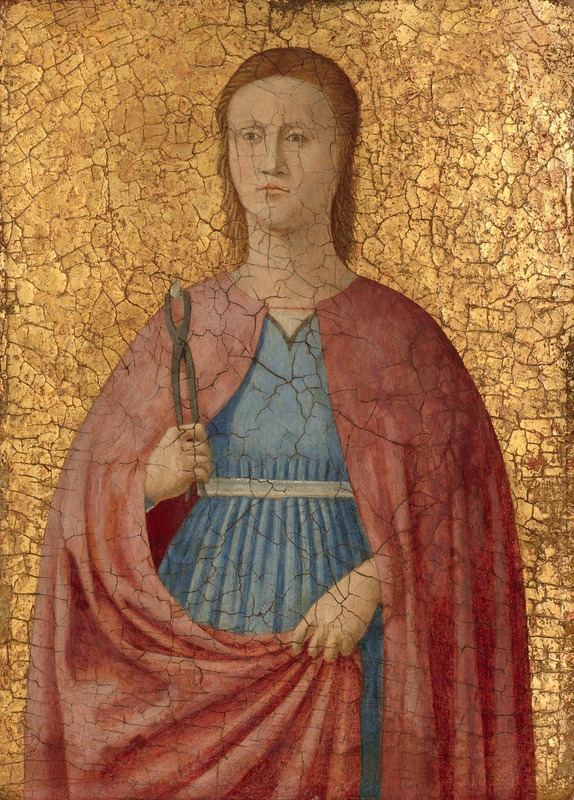 This exhibit of Saint Apollonia is by no means exhaustive but includes historically representative works of art donated to the Ward Museum, as well as other available images among many artistic renditions of her. De Meester, J 2006 The millenary anniversary of the city of Rome. Museum of the National Bank of Belgium. 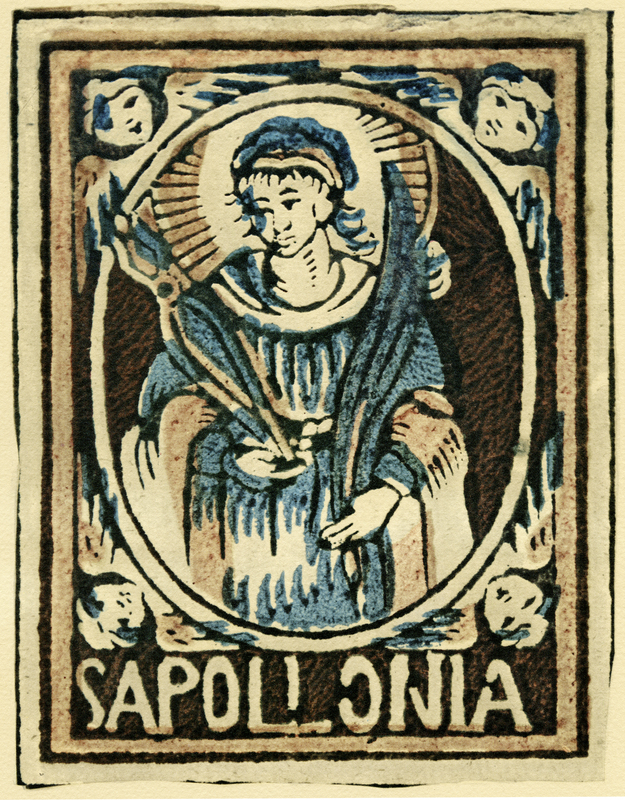 (nbbmuseum.be/en/2006/05/anniversary-of-rome); Donnelly, R 2005 St. Apollonia: the patron saint of dentistry. J Hist Dent 53(3):97-100; Eramo, S et al 2017 A “Sacra Rappresentazione” of Saint Apollonia’s martyrdom. J Hist Dent 65(2):63-72; Foley, GPH 1972 Foley’s Footnotes: A Treasury of Dentistry, Wallingford, PA: Washington Square East Publishers; Kanterman, CB 1985 Dentistry’s most famous lady: a definitive report on Saint Apollonia in legend and art. Tic (Ticonium Company magazine) 44(1):1-4; Kelly, HA 1919 Saint Apollonia — the patron saint of dentistry. J Natl Dent Assoc 6(5):400-412; Lantz, A 2016 Saint Apollonia, patron saint of odontology. Hektoen Intl J (hekint.org) 8(3), Chicago, IL: Hektoen Institute of Medicine; “Medical Heritage Society” 1971 Saint Apollonia (d. 249 AD) patroness of dentistry. Chicago, IL: Medical Heritage Society; Peyraud, AP 1975 St. Apollonia: dentistry’s spiritual benefactress. CAL (Certified Akers Labs magazine), 38:5-9, Feb; Rezai, FR 1979 More on Saint Apollonia: correcting an earlier error. Bull Hist Dent 27(1):36-38; Thurston, HJ and Attwater, D (eds) 1990 Butler’s Lives of the Saints. Westminster, MD: Christian Classics. 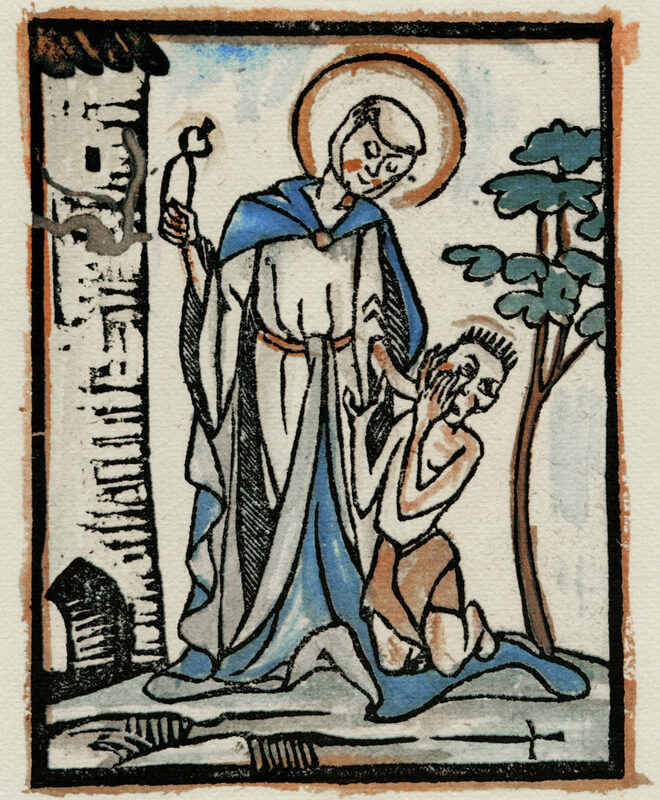 In this 15th-century illustration, reproduced from an enlargement of a woodcut (unknown artist), St. Apollonia expresses compassion for the toothache sufferer, soothing his swollen cheek with one hand while grasping her symbolic forceps-with-tooth in the other. Sister Wendy Beckett describes St. Apollonia as “a tough old Egyptian lady,”2 and, appropriately, this setting may suggest a North African scene, with a Moorish tower and tropical tree in the background, and a local beseecher with Nilotic hairstyle and attire. St. Apollonia, oil on canvas, as imagined in 1670 by pious Italian Baroque period painter Carlo Dolci of Florence. 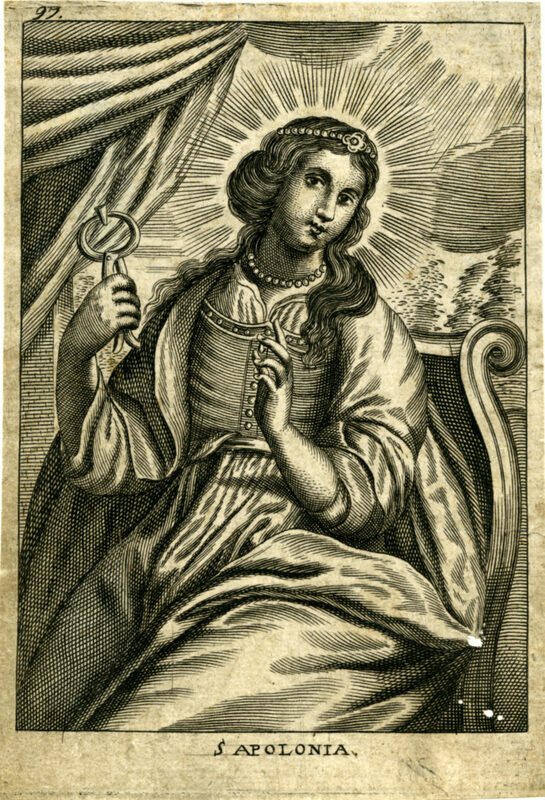 This original 17th-century Dutch woodcut (unknown artist) of the saint finds her seated in a formal setting, elegantly dressed and wearing a tiara with matching necklace. 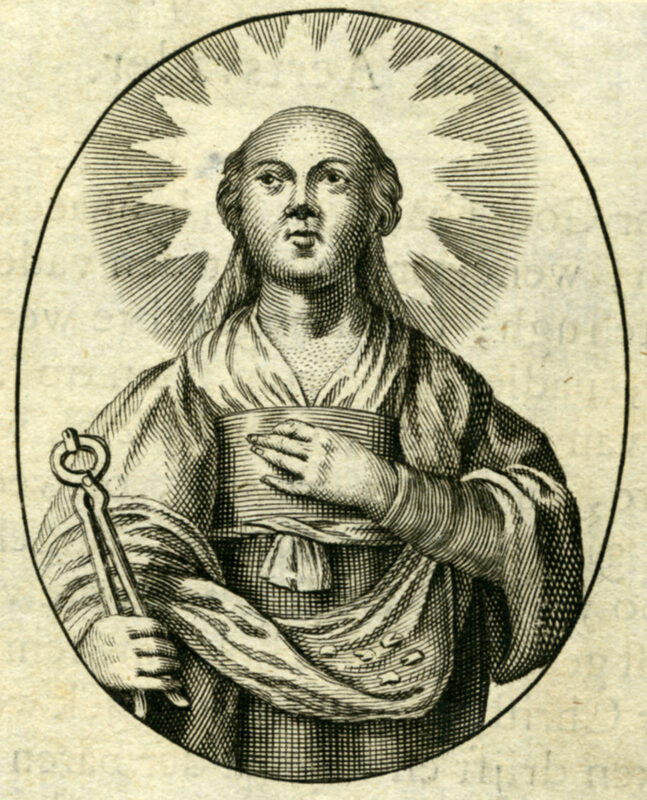 In this 18th-century Dutch woodcut (unknown artist), St. Apollonia appears severe, with little hair on the crown of her head, yet serene. Holding her insignia forceps-with-tooth in one hand, she carries isolated teeth in the folds of her robe. 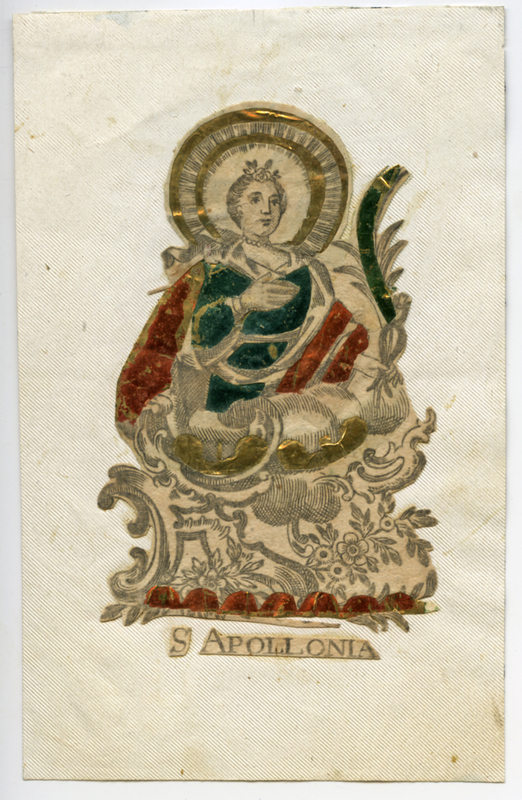 St. Apollonia strikes an aristocratic pose, wearing contemporary, fashionable clothing and a small crown, signifying royalty, in this 18th-century aquarelle on parchment image (unknown artist) taken from a prayer book. Early accounts indicate she held prominent status in Alexandria’s Christian community, but a regal heritage was not implied until late in the Middle Ages. In this portrait, her elegance and stylishness suggest a French artist’s influence. 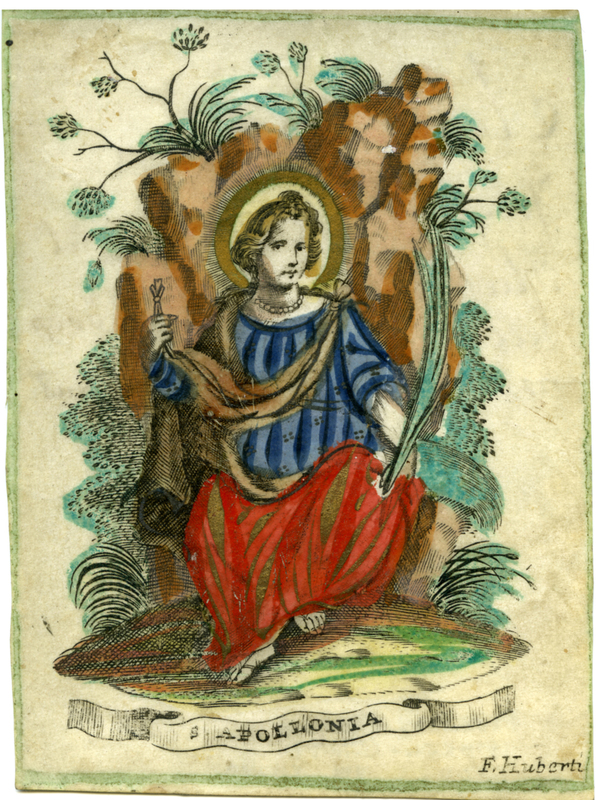 F. Huberti, possibly a local artist, created this 18th-century water color-washed woodcut of St. Apollonia sitting against a lush background and dressed in a colorful costume. She grasps a delicate forceps and martyr’s palm in either hand. Written in Dutch on the back of this small painting, which may have served as a birth certificate, are a boy’s name and his date of baptism: June 24, 1789. 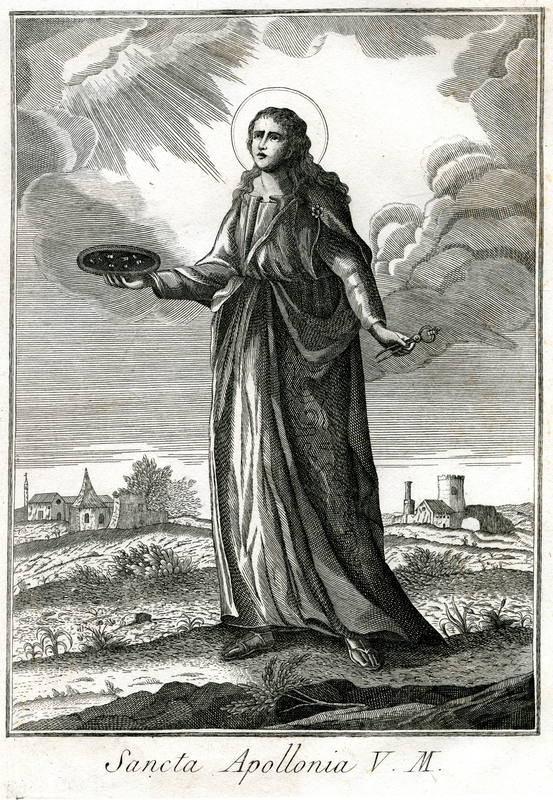 This 19th-century black & white original engraving (unknown artist) shows St. Apollonia standing in a field of stylized corn, grains and buttercups holding her symbolic forceps-with-tooth and a platter of isolated teeth. She gazes upward at a radiant sky. “V. 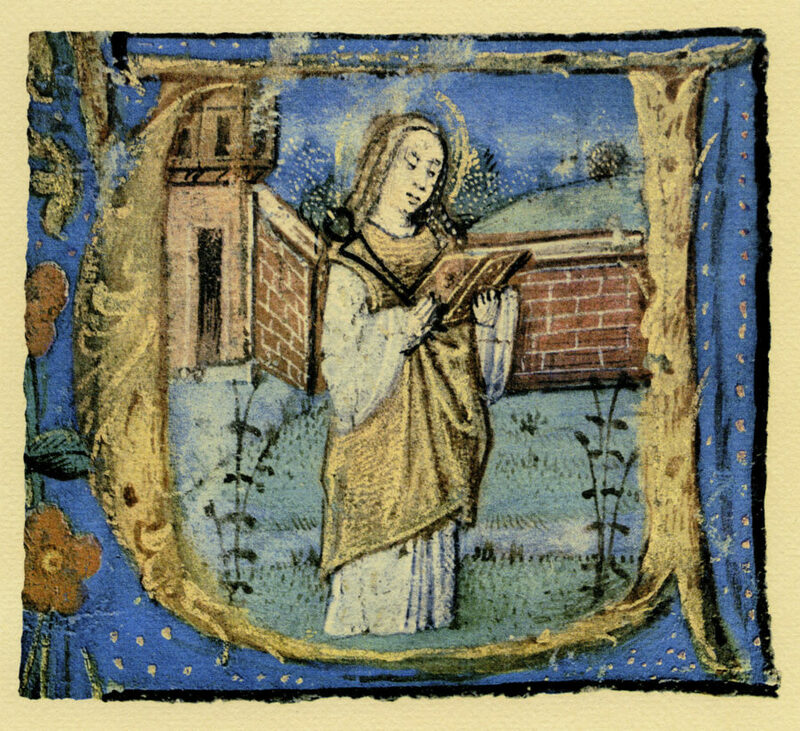 M.” signifies her virgin-martyr status. 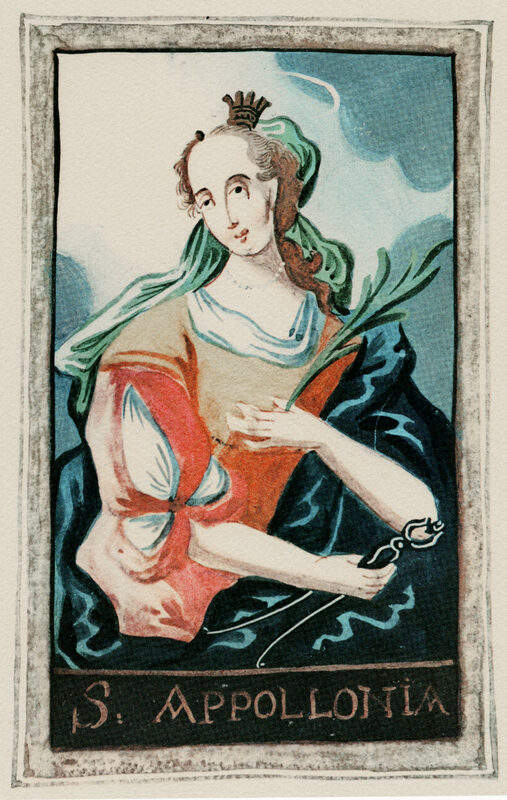 In this 20th-century printed advertisement (unknown artist), a pensive St. Apollonia prominently displays her distinctive forceps-with-tooth. She is surrounded by interwoven Calla Lilies whose stems are intertwined with other dental instruments possibly available for purchase from the Interstate Drug Exchange Inc. Dental Catalog. 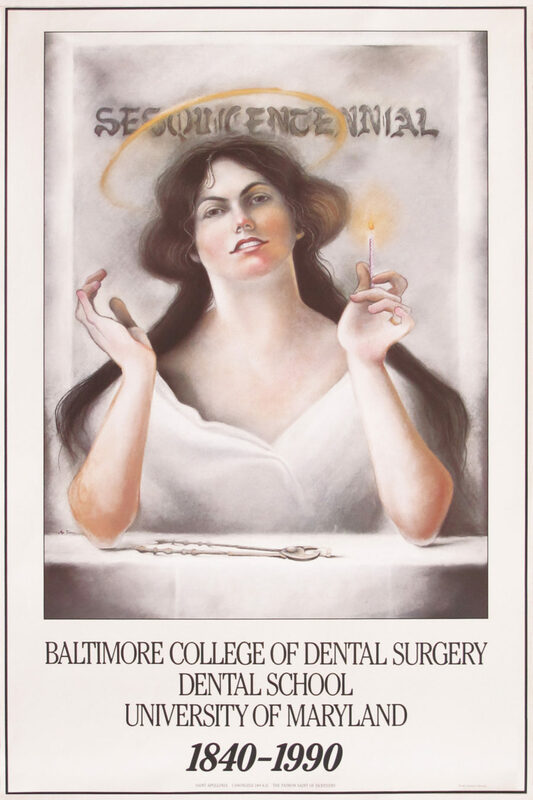 St. Apollonia gracefully holds a candle to mark the 150th year of the Baltimore College of Dental Surgery, the oldest dental school in the world,9 in this celebratory poster commissioned from artist Moe Turner by the University of Maryland. In this 21st-century Neo-Coptic painting, derived from the artistic style of ancient Egypt, artist Fadi Mikhail adorns St. Apollonia in simple white cloth with matching headscarf. 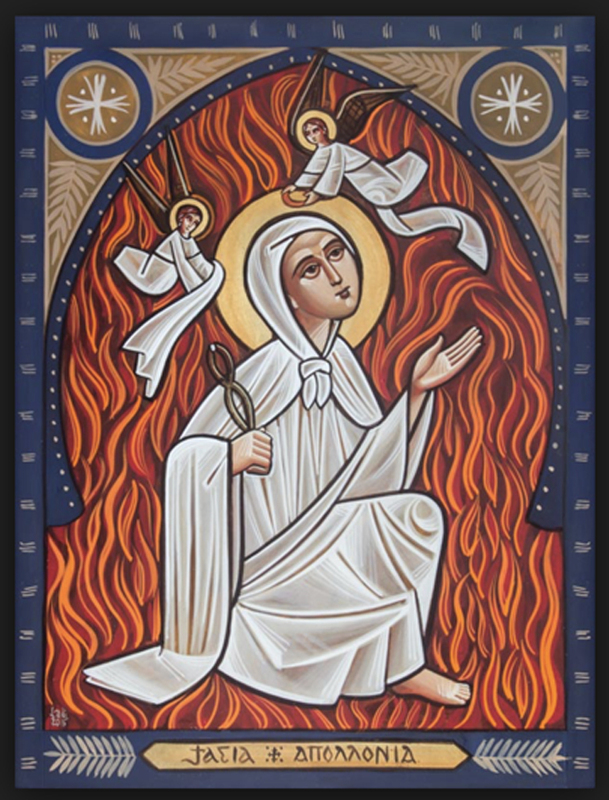 Bordered by the fronds of martyr palms and with angels hovering above, she kneels, encircled by flames. 1Beckett, W 1996 The Mystery of Love: Saints in art through the centuries. London: HarperCollins Publishers. 2Beckett, W 1998 Sister Wendy’s Book of Saints. Chicago, IL: Loyola Press. 3“Busacca Gallery” 2013 Ceramic Terra Cotta Boy Sculpture Marker & Epitaph by L. Sciocchetti (busaccagallery@sbcglobal.net). 4Ferguson, G 1961 Signs and Symbols in Christian Art. New York, NY: Oxford University Press. 5“Frick Collection, The” 2017 Saint Apollonia painting description (frick.org). 6Hughes, EM 1986. Artists in California, 1786-1940. San Francisco, CA: Hughes Publishing Company. 7Kirk, EC and Anthony, LP (eds) 1918 St. Apollonia and her picture in the Nidaros Breviary, by John Wessler. Review of Current Dental Literature, The Dental Cosmos 25(1):87. 8Lantz, A 2016 Saint Apollonia, patron saint of odontology. Hektoen Intl J (hekint.org) 8(3), Chicago, IL: Hektoen Institute of Medicine. 9McCauley, HB 2003 The first dental college: emergence of dentistry as an autonomous profession. J Hist Dent 51(1):41-45. 10“National Gallery of Art” 2017 Saint Apollonia, provenance (nga.gov). 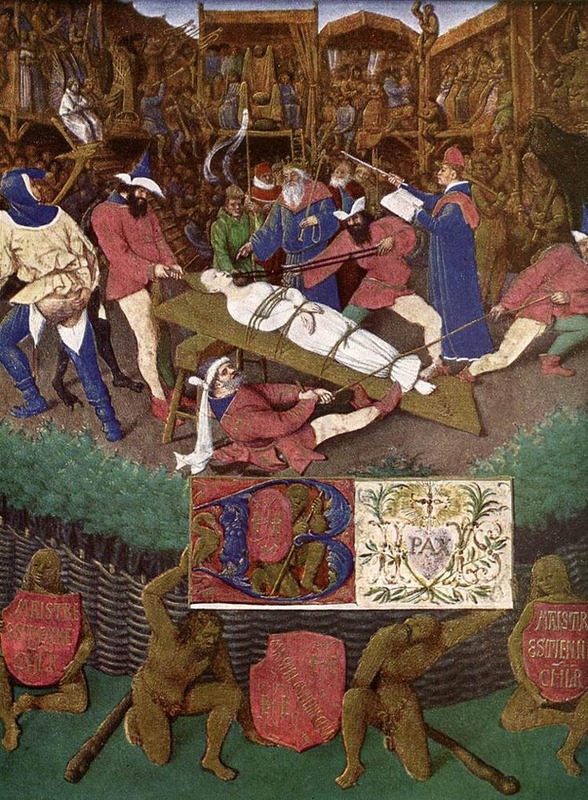 11Reynaud, N 2006 Jean Fouquet: Les Heures d’Étienne Chevalier. Dijon: Éditions Faton. 12Ring, ME 1985 Dentistry: An Illustrated History, New York, NY: Abradale Press. 13“Web Gallery of Art” 2017 Miniatures from the Book of Hours of Étienne Chevalier (1452-60) (wga.hu). 14Wynbrandt, J 1998 The Excruciating History of Dentistry. New York, NY: St. Martin’s Press.